Palo Duro Tara was adopted today by Faye and George of West Chester. They are keeping her name Tara so she'll start her new life with something familiar. Smokey, their gorgeous grey cat let Tara know immediately that HE was going to be in charge and was not going to be in the family photo. 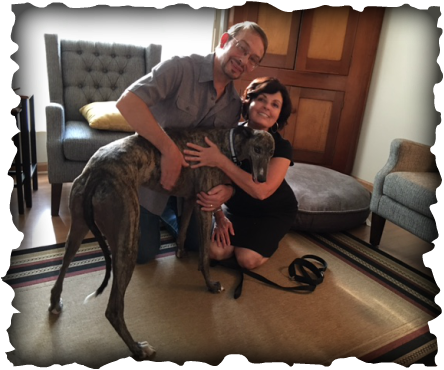 This family has lots of love to share and the understanding of greyhounds needs. Tara is going to have a greyt life. They also want to learn more about greyhounds and become involved with GAGC.